I adore gumbo. Happily, when I lived in Sacramento I discovered a Jamaican restaurant, Celestine's, that specialized in gumbo. It was a different style of gumbo than I knew from New Orleans but absolutely excellent. 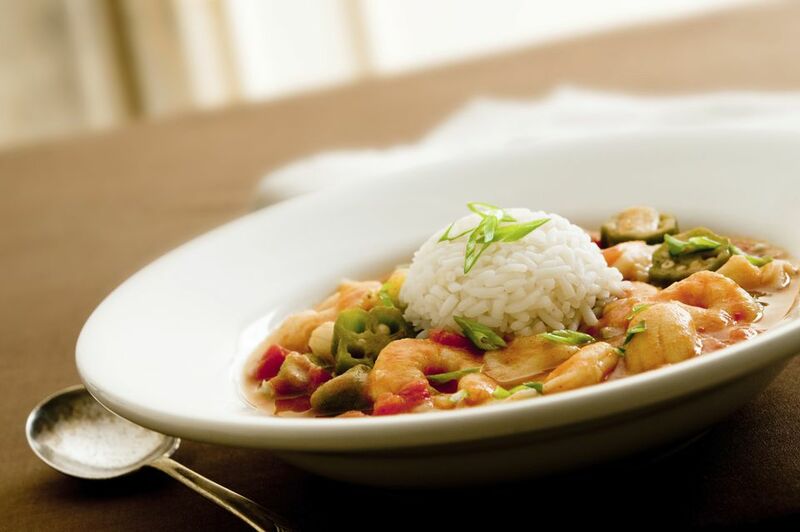 Gumbo is distinguished by the roux - a combination of oil or fat and flour. But while in traditional French cooking roux is a thickening agent, in Creole and Cajun cuisine it is a flavoring agent - the roux is often cooked to the point that it has almost no thickening power - just flavor power. In gumbo thickening comes from okra or file. 1. Make the roux using corn oil and flour in the oven. I like a good dark mahogany brown color - about 35 minutes. Set aside. 2. Season chicken with salt and pepper. Heat 1 tablespoon oil over medium high heat in a dutch oven and brown chicken. Set chicken aside on a plate. 3. Reduce heat to medium and add the roux. Heat for about three minutes. 4. Add onion, bell pepper and celery. * Cook, stirring almost constantly, until vegetables soften. 5. Add garlic and cook for another minute. Add 1/2 cup stock and deglaze pot, scraping up browned bits. 6. Add remaining stock, tomatoes, tomato paste, and herbs and spices. Bring to a boil and immediately reduce heat to a simmer. Cook for 30 minutes. 7. Add chicken and sausage and cook for another 15 minutes or until chicken is tender. Add shrimp and cook another 4 minutes or until shrimp is done. 8. If okra is in season, add 1/4 cup of sliced okra with shrimp to thicken sauce. If out of season add 1/2 teaspoon file powder. Neither is required , both are good. Serve with rice. With hot sauce on the side. *Note: The combination of onion, bell pepper and celery is referred to as the Cajun Trinity and is the equivalent of the French mirepoix with bell pepper (which does well in Caribbean climates) replacing carrot (which doesn't). Note: You can add anything you want to gumbo. During January or February I'll often make gumbo just using crawfish. You can do a pure seafood gumbo with shrimp, clams, and crab or a pork gumbo with Andouille, tasso (or some other ham), and cubed pork. The two inescapable basics of gumbo are the dark roux and the Cajun trinity.